On Friday, March 27th, Governor Brown signed emergency legislation (AB 91 and 92) that will expedite $1 billion for drought and water infrastructure projects, including emergency food aid, drinking water, water recycling, conservation awareness, and flood protection. Although the bills have been called emergency drought legislation, nearly two-thirds of the funding allocated by the legislation is slated for flood control projects. A vast majority of the funding authorized by this legislation is provided through previous budgets or bond measures, rather than new money. The legislation also authorizes fines for illegal diversions, a move that targets marijuana growers that are illegally diverting rivers and streams. In addition, the bill establishes the Office of Sustainable Water Solutions within the State Water Resources Control Board. The office will primarily work to promote permanent and sustainable drinking water and wastewater treatment solutions in rural and disadvantaged communities. The Association of California Water Agencies in partnership with the statewide conservation education program Save Our Water conducted a statewide poll showing that a vast majority of California residents believe it is important to conserve water, regardless of drought conditions, and are willing to make significant changes to their own usage in order to conserve water. 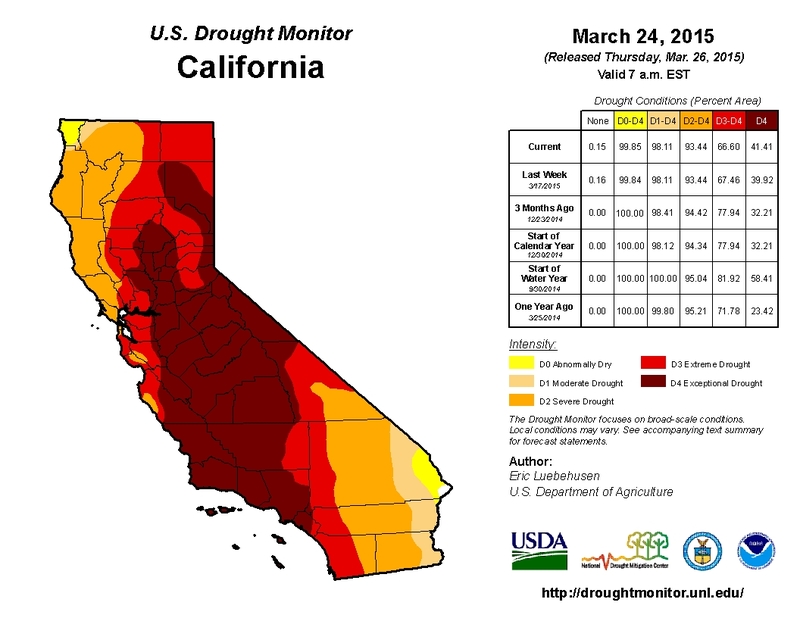 Another poll, conducted by the Public Policy Institute of California, found that Californians are worried about their water supply and that people in their region are not doing enough in response to the drought. 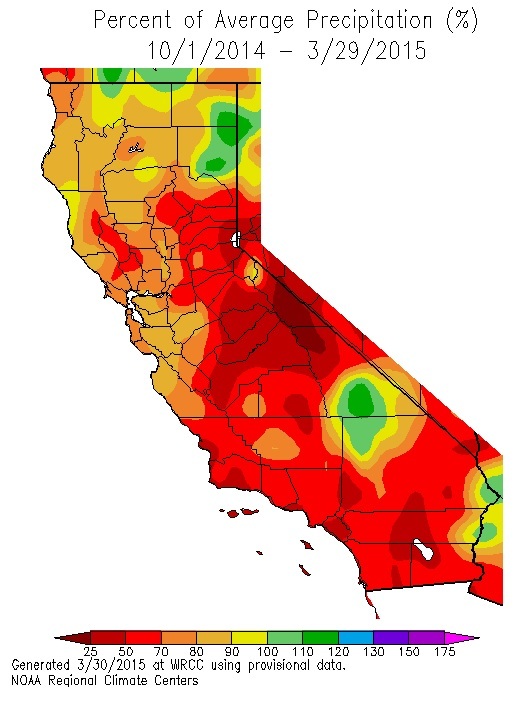 The California Department of Water Resources (DWR) published a report comparing the hydrology and impacts of the current drought to the state’s most significant historical droughts. Tomorrow, DWR will release the results of the year’s fourth manual snow survey. Electronic surveys show that the snowpack is at 8% of the historical average for late March. Drought conditions have changed only slightly from two weeks ago, with 41% of the state (up from 40% last week) now in “exceptional drought”. 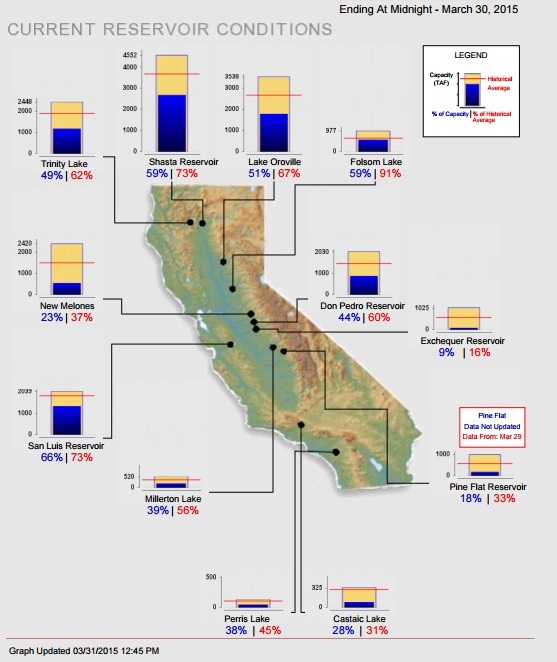 Statewide, California’s major reservoirs (representing 27.3 million acre-feet of storage) are 65% of average.